When it comes to backyard playgrounds, everyone has a different definition of what is the best. Children think that the best playground has the most equipment that they can play with. Adults say that the best playground is the safest one that presents the fewest dangers to children. In addition to safety, there are a number of other factors to consider as you research the best playground sets for backyards. The cedar wood is the biggest highlight of the Backyard Discovery Skyfort II All Cedar Wood Swing Set. Kids and adults find cedar to be more appealing than steel or plastic. The material is made to last through years of heavy rain or snow. Play set owners can seal or polish the wood to add more years of protection. The clubhouse is the most unique feature of this backyard set. The miniature house has several windows, including a separate balcony, with a ladder and climbing stairs to access it. It’s the ideal solution to a dangerous tree house that is built by hand and rests too high above the ground. The low heights of all features, from the monkey bars to the fort, make this set safe and easy to handle. Beneath this wooden house is a small picnic table area that is protected from the sun and rain. In the swing area, there’s a sandbox for added enjoyment. The swing set glider allows two people to swing at the same time. The swings are made in safe children’s sizes and heights. I CANNOT SHIP TO FREIGHT FORWARDERS!! The Lewiston Retreat by KidKraft is a playhouse, play kitchen and backyard playground all in one. Kids will find a swing set on one side and a fast speed Twist N’ Ride tube slide on the other. There is a wavy slide in the front and an elaborate playhouse in the back. Kids can invite plenty of guests over because the set is made to accommodate a dozen kids at one time. The miniature house is two levels with kid-style doors and windows. Inside is a clock, mailbox and play phone. Kids have their own small kitchen with a play sink, stove and accessories to improve their cooking skills and their own space to do homework, draw and other indoor activities. Every part of this playground is safe with low heights for the swing and playhouse. It’s ideal for parents who don’t want to monitor their kids every second of the day. An assembly kit is included with user-friendly instructions. Have your play set ready within hours without having to call and wait for a professional. 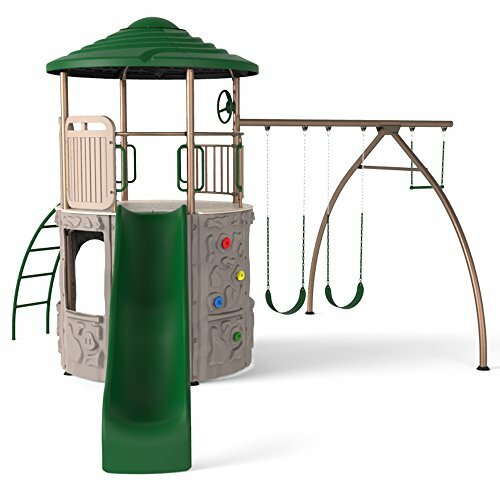 The Gorilla Playsets Nantucket Swing Set has the standard features and a few extra ones that make an elaborate play area. There are two swings, a wavy slide and a sandbox. The balcony has a covered tower with a faux chimney. Kids find the toy telescope, steering wheel and tic-tac-toe board to be interesting touches. On one side is a wooden ladder to climb up on, and on another side is a child-friendly rock climbing wall and rope. The Nantucket Swing Set is safe and enjoyable for toddlers and kids as old as 10 years. The cedar wood design makes the set sturdy and reliable for decades. If installed correctly, the set is never a construction hazard. After years of being outdoors, the playground has scratches at the most with no rust or major signs of damage. If any injury occurs on this swing set, 9 times out of 10, it wasn’t caused by its carefully crafted design. The installation process is easy with pre-drilled beams and a step-by-step guide manual. Assembled Dimensions: 251" x 136" x 123"
Both the turbo tube slide and side winder slide are proudly made in the USA and feature a Lifetime against cracks and breaks! The main features of a standard play set, including swings, slides and monkey bars, are found in the Swing-N-Slide Deluxe Play Set. The balcony leads to two unique types of slides – one shaped like a tube and another that curves on the way to the ground. Kids who love climbing and exploring will love this set. They have their own personal space to chat with friends and spend time away from their parents. This set is the perfect solution for them to enjoy being outdoors more often. A play set like this one is a starter for children to become more physically fit. Climbing improves balance and increases upper body strength. The Swing-N-Slide Deluxe Play Set provides hours of exercise and entertainment for young ones. All of the wood pieces and play equipment are found in one box and easy to assemble. The stained lumber remains strong and durable under any type of weather. With a lifetime warranty, this play set is reliable and can be passed on from one generation to the next. 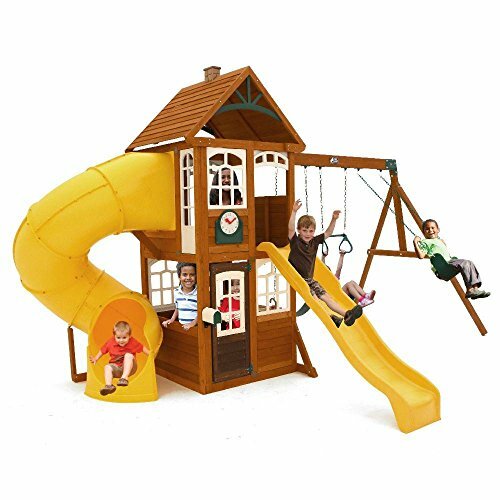 Lifetime Adventure Tower Playset is a freestanding, all-in-one play set. There are two swings with a trapeze bar for kids who love to swing, hang upside down or do flips. There is a slide in the front with a curved ladder on the side. The ladder and rock climbing wall lead up to a clubhouse with a balcony and roof. Just beneath this house is a fort where kids can hide out and get shade from the sun. 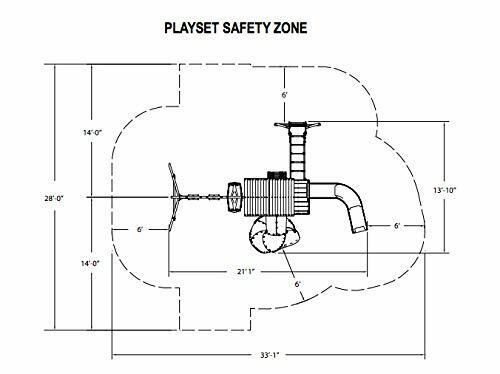 The play set is surprisingly sturdy for one that’s so easy to install; however, it should be placed on a solid, even surface. Unlike wood sets, the plastic construction ensures that the equipment will not warp, crack or bend under the weather. The set weighs at least a hundred pounds and is held up by steel poles, so the wind will not knock it over and it won’t collapse. Safety is not a concern with the Lifetime Adventure Tower Playset. Toddlers should not be allowed on the set without supervision. Kids from ages 5 to 10 can enjoy it safely with minimal supervision. The Number of Choices Is Overwhelming. What Should I Include in My Playground Set? Consumers like having many options, but on the other hand, they complain about being bombarded with too many options. They know what a typical playground set looks like, but there are dozens of types of equipment available that they don’t know which ones to choose. First, know about the standard equipment that is found in a backyard play set. There are swing sets that vary by the number of swings. Schoolyards tend to have dozens of swings available for kids. Most kids enjoy swinging, so it’s recommended that every playground have a swing set. The slide is another popular type of equipment that most children enjoy and should be included. Next, there are monkey bars, also known as the jungle gym, the merry-go-round, the seesaw and chin-up bars. In addition to buying standard equipment, choose additional equipment for a customized playground. Add a trampoline or trapeze net for older kids. For toddlers, add a spring rider, playhouse or sandbox for safer playing. Always review the level of safety for any extra equipment you consider. It’s common to have courts nearby where kids play various sports, such as basketball, volleyball or baseball. Ask your kids which sports they like to play the most and build a court for them. Another option is to add sand to the flooring of your playground. Sand is a common safety feature that works to break kids’ falls from slides or high bars. Also, most kids prefer to play in sand over grass or pavement. It’s common to see bounce houses in some backyards. Consider placing an inflatable bounce house next to a hard play set for the perfect contrast. If kids get bored with one type of playground, they can switch between the two. Out of all playgrounds, there are a few that are exceptional in function and appearance. Some play sets can be customized to fit the specific tastes of an individual child. One set can be designed for a baseball fan, while another can have a princess theme with a castle playhouse and moat. Before you consider making a unique design, know the basic factors to look for in a standard set first. What Are the Qualities to Look for in the Best Backyard Play Set? Every parent worries first about the safety of a playground. A play set is safe when it doesn’t fall apart easily and collapse on top of children. The weight is a major factor that determines its safety. Equipment that is too heavy could break apart, making it too dangerous for kids to play with. It’s important that parents choose a lightweight play set with a restricted weight limit. There are rare situations when accidents are not directly linked to the manufacturer. However, in most cases, the manufacturer that you choose is responsible for creating a safe equipment and preventing injuries from occurring. A good playground has all of the standard equipment, such as a jungle gym and swing set. The best playground has more than a few standard features that include basketball courts, sand piles, trampolines, etc. Look for a wide range of features as you make this investment. No one wants a play set that breaks apart after a few months. The best one lasts for several years with minimal maintenance. Allow it to be rained on, snowed on and used by dozens of children while still remain standing with only a few cracks and splinters. The type of material is the most important factor that determines reliability and durability. The best type is aesthetic, functional and durable. Wood is an aesthetic and reliable material, especially if it’s sealed, but it’s not the most reliable kind. Unsealed wood breaks down quickly after constantly being rained on, and it could be completely ruined after a flood. In most backyards, though, wood is sturdy and long lasting under normal conditions. Steel lasts longer and withstands every natural element without any damage. Plastic is not very strong and may not support the weight of many children, but like steel, it lasts for decades with minimal damage. Like plastic, vinyl does not scratch easily and lasts for years with barely any wear and tear. One of the last factors to consider is price. Obviously, no buyer should compromise safety for an affordable price. The best play set doesn’t have to cost a fortune, though. The cost varies based on the type of equipment, including the materials and designs, and the quantities of equipment that you buy. Many stores allow you to review the price ranges of their products. Know the average costs that people are paying for play equipment. For a high-quality standard set, expect to pay between $700 and $2,000. The price increases with the more personalized features you choose. Out of all the play set manufacturers, none give more variety and creativity than Backyard Discovery. You’ll find a wide range of themes, such as beachfront, cedar wood and castle, available at a wide range of prices. KidKraft has been making dollhouses, play kitchens and play sets for more than 50 years. They provide different models of standard wooden swing sets that are known for having clubhouses and tube slides. Gorilla Playsets has a wide range of play equipment from simple net swings to elaborate swing sets. Their materials are pre-cut, pre-stained and easy to assemble in any backyard. The U.S.-based Swing-N-Slide company has provided do-it-yourself backyard playground products since 1985. They specialize in making safe, customized products that they test for safety. Lifetime makes freestanding play equipment that parents and older kids can assemble on their own. Since 1986, Lifetime products have evolved from basic basketball hoops to dome climbers, picnic tables and now elaborate play sets. Little Tikes is a manufacturer that builds indoor and outdoor play sets for toddlers. IronKids designs outdoor playgrounds that promote playing and physical fitness. Their swing sets include trampolines, trapeze bars and monkey bars with each feature being designed to test physical strength and endurance. Does Age Matter When Buying Equipment? Yes, age does matter when you buy a playground set. Kids at different ages have different heights and weights. You wouldn’t buy a swing set for toddlers that is meant for elementary school kids. Likewise, older kids don’t want to play on equipment that’s designed for infants. How Much Does the Type of Material Matter? The most commonly used construction materials are safe, damage resistant and long lasting. Wood, steel, vinyl and plastic are known to last for many years in the backyard. However, there are several key differences. Steel and plastic sets tend to last longer than wood ones in wet or humid conditions. Wood is more aesthetic and traditional since it’s been used in construction for centuries. Steel is heavy and could be dangerous if the play set is built incorrectly and falls apart. Plastic is waterproof and durable, but there are some weight limits. So, the type of playground material that you use is important, and you’ll receive different results for different types of materials. What Are the Most Common Problems With Playground Equipment? 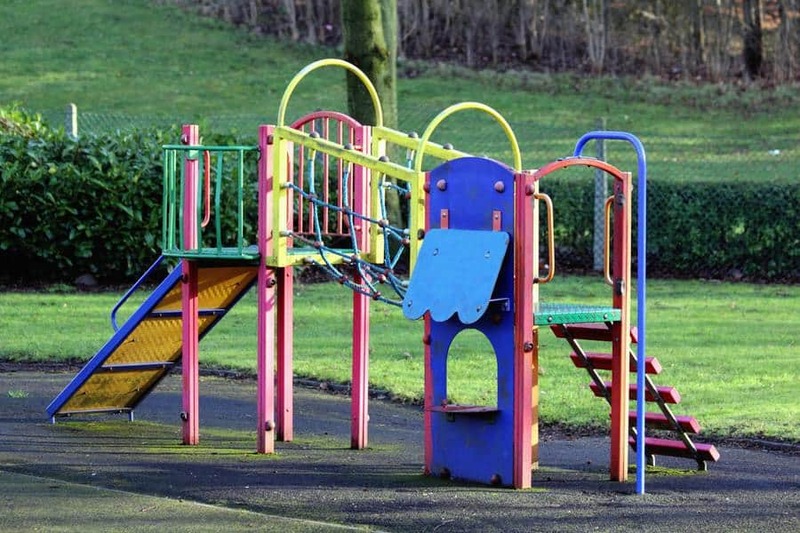 Inferior equipment that falls apart is the most common complaint about playgrounds. The solution is to buy equipment made of high-quality materials and to check the price, which is the best indicator of quality. Sometimes, the weather affects the usability of the playground. Metal absorbs a lot of heat and becomes too hot to touch on some days. In hot climates, it’s ideal to buy wood equipment instead. In rainy climates, it’s ideal to skip wood that deteriorates in the rain and choose steel or plastic. Quality and safety are the two main factors to consider when looking at the best playground sets for backyards. 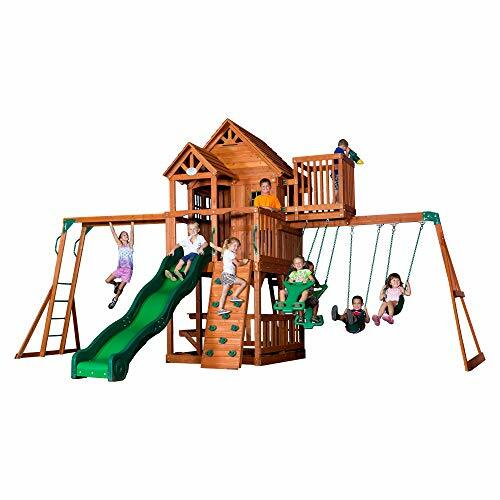 Backyard Discovery Skyfort II All Cedar Wood Swing Set is the number one choice because of its high-quality craftsmanship and high name value. 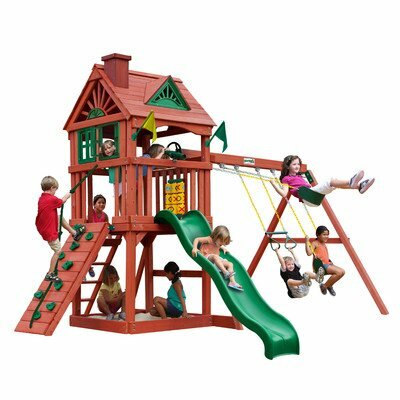 Backyard Discovery has established itself as being one of the most popular manufacturers that is known for its a wide range of play set models. The cost of the Skyfort II set costs more than $1,000, so if you need something less pricey, consider a slightly smaller set like the KidKraft Lewiston Retreat. However, taking a price that is too low means compromising safety and quality. Always find other selections of play sets that are offered by the Backyard Discovery. Their prices are reflected in their quality products, which are highly rated online. The Skyfort II is made of sealed cedar that remain free of cracks and splinters for years. Find a variety of play equipment in one place – swings, a slide, monkey bars and an observation deck. Some play sets look the same, but the results are different. Learn more about the Backyard Discovery sets and find out if you are buying the best one. Find more fun activities for your backyard here.